Amazon is experimenting with a new 30-hour work week, which is really cool, especially since the average American works 1,700 hours a year. For many, that means a lot of time spent sitting in an office. Working long hours takes a toll on your physical and mental health if you’re not mindful, and if your employer isn’t tuned into the importance of healthy employees to their company. An increasing number of companies are protecting their investment – their people – because they are aware that disengaged, sick, and depressed employees cost the economy at least $300 billion every year. For employees, too much time at the desk makes it easier to skip the gym after work. The risk of heart disease, diabetes, certain types of cancer, and higher rates of depression and obesity are the negative consequences of a sedentary lifestyle. While millennials are the first generation to really reimagine the 40-hour work week by choosing when and where they work rather than going to a 9-to-5 desk job, many people still don’t have that luxury. So, if you don’t have the opportunity to reduce your weekly hours like Amazon or to flex out of the office, what can you (and your employer) do to stay healthy and peaceful? I’m not talking about lavish lounge rooms and all-you-can-eat buffets, either. If this sounds simple, it is. Take a 15-minute break in the morning and another one in the afternoon. Just as the morning meal wears off or the afternoon lull sets in, go walk briskly around the block or building a few times. That’s 30 minutes a day, five times a week, 52 weeks a year: 130 hours of walking. For those trying to watch their waist lines and stay heart healthy, this small step is actually a big deal. Walking clears the mind. But if regimented strolling gets boring or you’re sick of listening to chirping birds day after day, mix it up. You can walk or sit while listening to a relaxing meditation app on your phone. There are tons of free apps to download. Taking a mind break will help you focus back at your desk, even if you don’t think meditating is for you. 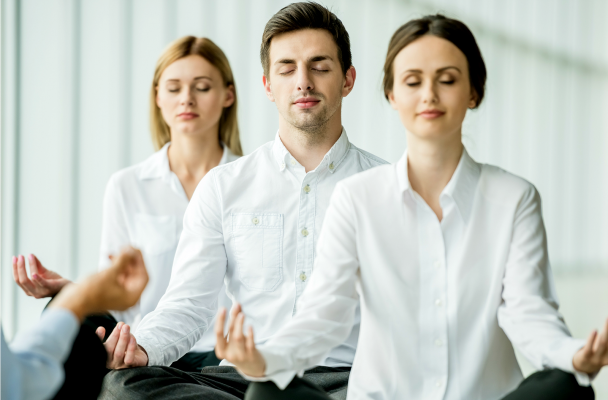 Ask your employer if they’d be interested in having a yoga instructor come to the office for a 20-minute session, either before work starts or right after. This could be a monthly occurrence if it’s in the budget. For people who enjoy yoga, it’s awesome. For people who haven’t been introduced to the practice yet, it’s awesome. Americans are notorious for not using their vacation time. Workers are barely using five vacation days a year, on average, the U.S. travel Association found. This is crazy to me. If you have the days, use them. Vacation – time away from work – helps people relax and spend time doing things they enjoy with the people they love. You aren’t a slacker for taking vacation days. Your job will still be there when you get back. If it isn’t, time to get a new job for a company who appreciates you. Employees want to do their best work and take pride in their accomplishments, but they can’t forget to take care of themselves along the way. The above suggestions don’t cost a thing for workers but pay off big time mentally and physically.